Audi Certified. WAS $50,995, $2,200 below NADA Retail!, EPA 30 MPG Hwy/21 MPG City! 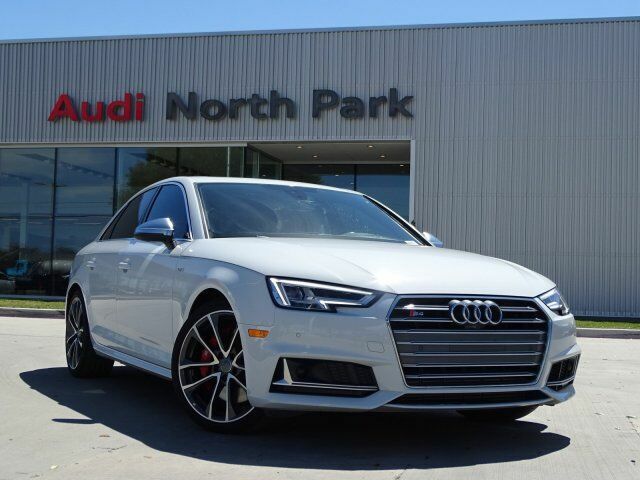 Heated Leather Seats, NAV, Sunroof, Rear Air, All Wheel Drive, Turbo, S SPORT PACKAGE, DRIVER ASSISTANCE PACKAGE, PRESTIGE PACKAGE READ MORE! PRESTIGE PACKAGE Interior Lighting Plus Package, door trim contour, door pockets and color options, Audi Connect PRIME & PLUS Online Services, subscription, MIB-2/Gen 2 features in addition to MIB-1: NVIDIA Tegra 3 processing, external voice recognition for smartphone personal assistant, INRIX XD Traffic, and over-the-air map updates, safety and emergency services, vehicle services and remote services, Audi Virtual Cockpit, 12.3" LCD fully digital instrument cluster w/1,440 x 540 pixel resolution and 2 visual modes: classic and infotainment, Full Color Head-Up Display, Top View Camera System, Dual Pane Acoustic Front Side Windows, S SPORT PACKAGE Sport Adaptive Damping Suspension Dynamically adjustable via Audi drive select w/-23 mm ride height from A4 standard suspension, Sports Rear Differential, Red Brake Calipers Rear Spoiler, MP3 Player, Sunroof, All Wheel Drive, Onboard Communications System, Keyless Entry, Child Safety Locks.